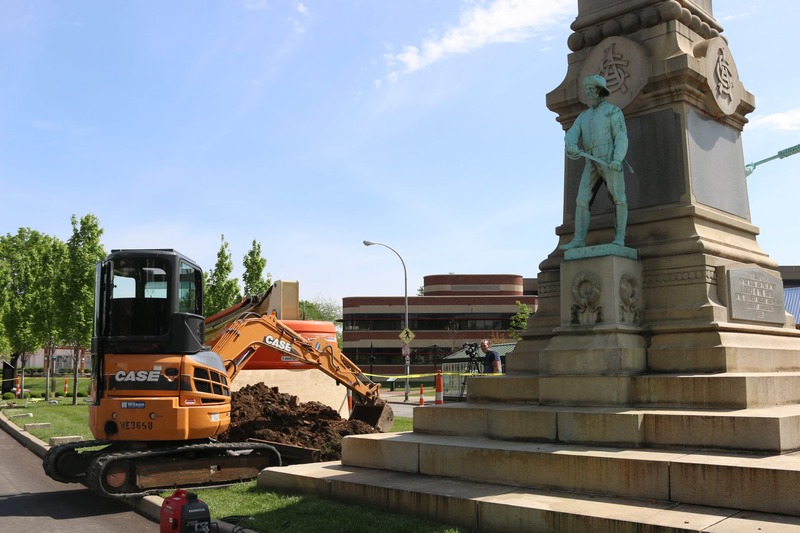 Construction of the monument's removal began on Friday. Construction crews began dismantling U of L’s controversial Confederate statue Saturday. The statue has a new home: Brandenburg, Kentucky. Mayor Greg Fischer’s office announced the move in a news release Nov.15, stating the statue is moving to a Civil War site in Brandenburg. A time capsule, supposedly embedded in the statue, will be loaned to the Filson Historical Society. Acting President Neville Pinto commented on the statue’s removal. U of L’s Foundation will pay a majority of expenses, funding $350,000 for its removal. The city will pay $50,000. The Brandenburg City Council and Meade County Fiscal Court accepted the statue Wednesday. Disassembly began Nov. 19. The statue will be moved to Brandenburg the week of Nov. 28. The move affects students and non-students who regularly walk past the statue, with some approving its removal. Others don’t have opinions on the matter. Statue supporters called moving it an “erasure of history,” protesting before a judge granted the city authority to remove it. Jamey Howe and John Faughender, non-student employees at the Speed Art Museum across the street from the statue, approve its removal. Located between Third Street and the Speed Art Museum, the statue was gifted to Louisville by the Kentucky Women’s Confederate Monument Association in 1895 and commemorates confederate Kentuckians who fought and died in the Civil War. Standing on campus for more than a century, the 121-year-old statue was first slated for removal by former U of L President James Ramsey and Mayor Greg Fischer seven months ago. Controversy ensnared the statue since, drawing protestors, litigation to stop the move and verbal blows between advocates and detractors. The statue’s removal was later approved, leaving the unanswered question of where it would relocate. Fischer chose Brandenburg based on recommendations by Louisville’s Commission on Public Art. Removal of the statue will shut down Second and Third Street from Nov. 19-23. If disassembly is not completed in time for the U of L and UK football game, one lane will open for both directions. And it’s gone; so be it. Well, I’m glad they at least found an appropriate location. I think if they’d decided on a location to begin with, there wouldn’t have been nearly as much outcry. The way they went about this made it seem as though the monument could remain in storage indefinitely. There isn’t much point to continue arguing about whether this decision was good or not, so I’ll just highlight the reason and be done with it. What exactly are you saying about Brandenburg Mr. Pinto? Interesting, how even in the most amiable terms possible, the pro-move stance still seems condescending at its core. I think that’s another reason so many were against it. I am ashamed to be an alumnus. The irony is that in the name of “diversity” we have excluded at least two groups of people: Americans who died in a war and women who wished to preserve their memory. It would seem that modern “diversity” only occurs when everyone has the same point of view. Sad. The only hate associated with this monument is from those who worked so diligently to see it removed (and at significant expense, i.e. waste).